At NovaLoca, our job is fairly simple. We need to let agents know about a great way to advertise commercial property and let business owners know the best place to find commercial property. The work we carry out every day ensures that we are the best place to advertise and find commercial property. 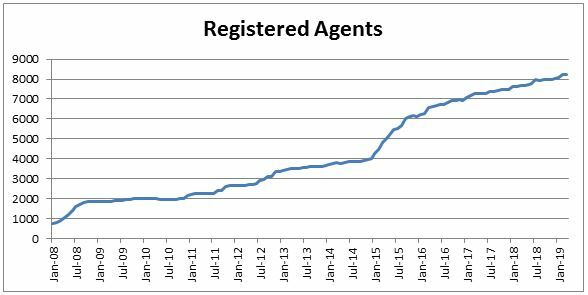 NovaLoca has seen a steady increase in Agent registrations since we launched in 2008. Registrations result from a mixture of agents contacting us, or being added as a result of subscriptions going ahead. We also have a proactive program of researching agents, usually focusing on one region at a time. Realising that nothing happens overnight, we ensure a steady level of relevant contact with, currently, 8,219 agents to inform and remind them of the great service NovaLoca provide. We invest hours every week adding and updating details on companies, researching company descriptions, updating logos and addresses and moving contacts to new companies. We also have a well maintained register of 43,363 current requirements on NovaLoca, with relevant new and updated properties going out by email every day to those looking for property. We make it as easy as possible for business owners to add requirements and importantly to unsubscribe when they are no longer relevant. Through our connection with MJM Marketing we also update property decision makers at the top UK companies, most recently including the property contacts at the Top 100 3rd Party Logistics Companies. We also update over 4,400 agents about new and updated property in their area. We continually invest in our website and the database that powers it. We realise the importance of a positive user experience and have migrated over the years to take advantage of the latest technology. Focusing purely on commercial property, we are constantly working to drive relevant traffic to the site. Visitors are now 4 times as likely to enquire about a property compared to 6 years ago. We also proactively check every data feed every 2 weeks and to provide the best customer service possible. At NovaLoca, our job may be fairly simple but it’s a huge challenge, a challenge that we are all passionate about.